Feeling lots this Christmas day since my mother’s death. I am missing my Mama. I haven’t been real big on Christmas for a long time, and I’ve never done the tree thing on my own. But this season, after my sis and I found some of Mom’s family tree ornaments while in storage unit cleaning mode, I started vibing that maybe I’d do a tree this year, a sort of ritual in honor of Grenelle. 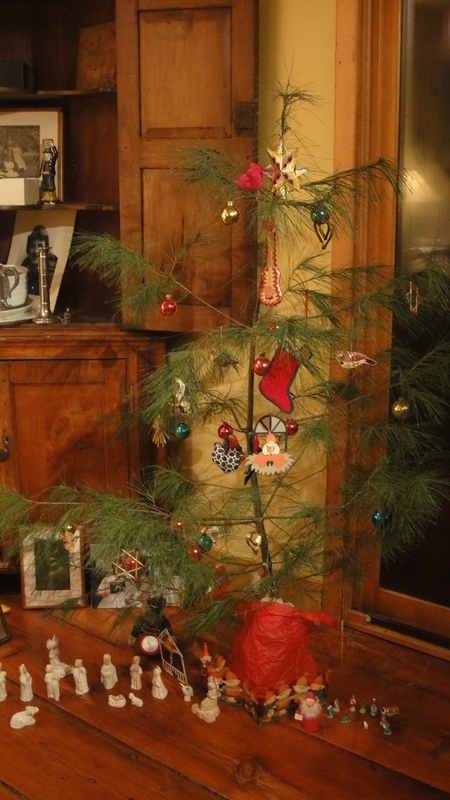 Yesterday I went out back in the rain and sacrificed a small white pine to be my charlie brown-style tree, and did the ritual dressing of the tree. For what felt like the first time in my life, I wanted to hear sweet carols–Silent Night, in particular, which I listened to over and over again. Tears poured from my heart like I hadn’t shed in months, feeling my Mom and missing her. I am glad she is free, and I know she is with me inside in important, real ways. I don’t regret her death, as I believe it was the best passing she could hope for given her illnesses, and I am so grateful that it was a gentle transition, and the one she wanted and worked so hard for. But still: sometimes I miss her being in body, able to speak together and feel each other’s warmth and soul and sweetness. I love you Mom. We are truly blessed through life, and death.